Nelson Veterans Tennis Club [NVTC] was formed in 1972 and is the base for Veteran Tennis players from all over the Nelson region. We play all year round on Thursday mornings from 9.30am. Potential new members are welcome to come along on any Thursday morning to join us. Our committee members will be delighted to introduce you to our players and explain the benefits of becoming a member of our club. Once a member, there is the opportunity to represent NVTC in fixtures and to enter Veterans Tournaments throughout the country. We do however have a strong social side to our club, so if tournaments are not your thing…..fear not!!! Everyone Welcome. 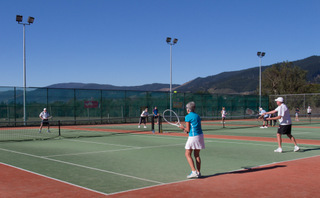 NVTC is based at Hope Tennis Club, Hope Domain, Main Road, Hope. 10 Astroturf courts, 6 floodlit. A good clubroom with all modern facilities. Currently NVTC has around 130 members. Nelson Veterans Tennis Club AGM Sunday 2017 AGM which will be on 11 June 2017 at 3pm. Social Tennis 1 p.m. at Hope. Contact Leona Ellis 03-5476916.